Only three papers left to go and then I'm all done with my Masters degree - woot woot! I know it's still a bit to go but I am so excited to almost be finished and to graduate! I've also got some sewing projects up my sleeve but nothing I can show right now, so how about some completed knitting instead? As I mentioned when I showed this project partway completed, I have a couple of girlfriends who are pregnant right now - I'm sure they know exactly who they are, but I'm not going to say right now so that at least there will be a bit of excitement when they receive their gifties in the mail. 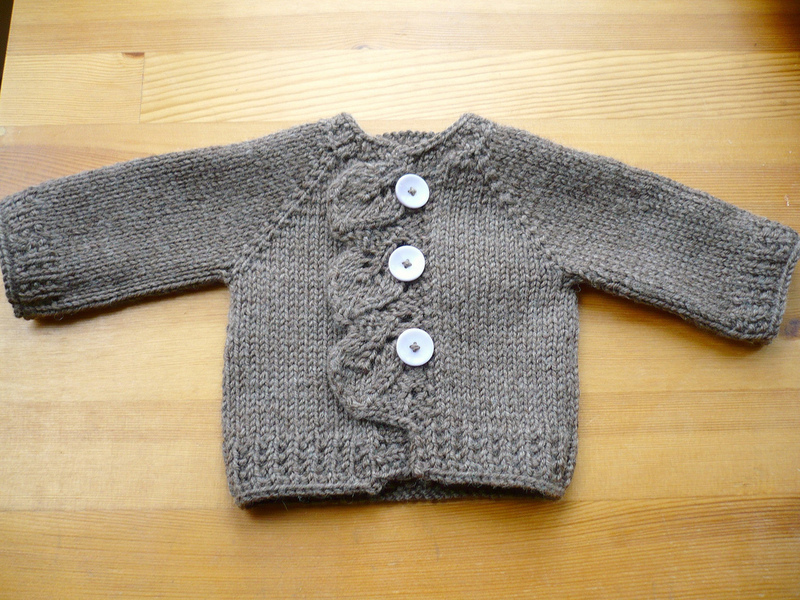 First up is my Firefly Cascade - this one is knit with Spud & Chloë Sweater in Firely. I just love the colour so much and the leaves on the placket are just too too darling! This is my Earthy Cascade - it's the same pattern as the cardigan above, but the yarn slightly lighter (worsted vs. aran weight). 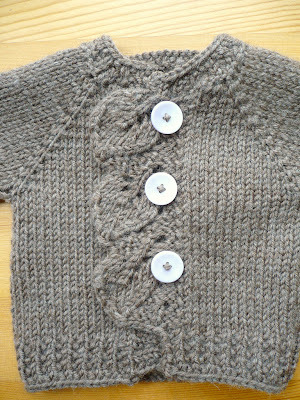 The colour is a bit off in the pictures above, it's a bit browner and the buttons are a very pretty lilac-grey. 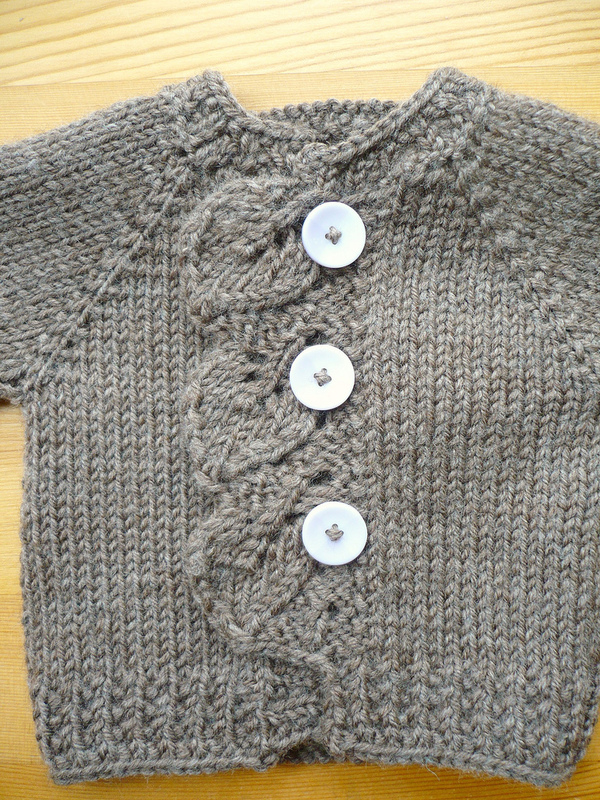 The yarn for this one is Cascade 220 Superwash in Walnut Heather; the leaves on the placket look a little different, but I think this is just because of the yarn I used. I steam blocked both of them (my first time steam blocking) and I really like the way they turned out. I originally intended to steam block the Firefly because of the cotton content of the yarn, but, since I actually had them both done at the same time, steam blocked Earthy too - I love the fact that I didn't have to wait for them to dry, woot! Now I just need to package them up prettily and then they'll be off in the mail to their new homes. 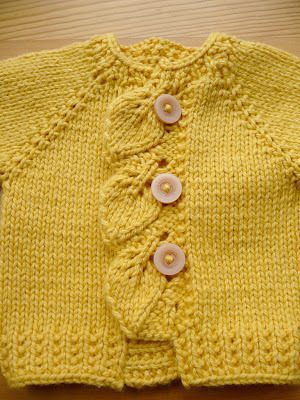 I really do love making things for my friends and it has been so so nice to knit up these cute little cardigans because I know that someday pretty soon they'll be keeping some very special babies warm! oh my goodness Kaye! these are so beautiful! the leaf detail is awesome! those are some lucky babies! Gorgeous, Kaye!! What beautiful baby gifts! The leaves are amazing! I wish I could knit like this! Wow, gorgeous sweaters! Lucky babies (and moms!). yeah, I'm with Jeni! Adult sizes?! I want one so bad! Those are the most beautiful little sweaters I've ever seen! Congrats on your almost gone with your Masters! What an accomplishment! Wonderful! Very cute sweaters. The detail is very pretty. Thanks for sharing these. Lucky little ones will wear them. Those are soooo adorable! 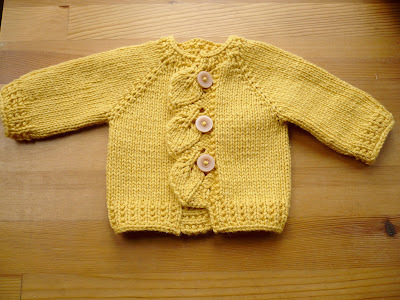 The babies will look so cute in them! Congrats! I LOVE the leaves on the placket. Could you whip one up in my size today?? oh those are the cutest things! I wish I could knit, but then, when would I quilt?????? I am just getting back to knitting and those leaves are gorgeous, but I don't know if my confidence level is up to that just yet... Well, maybe a try anyway. Thanks for posting such pretty things to look at! 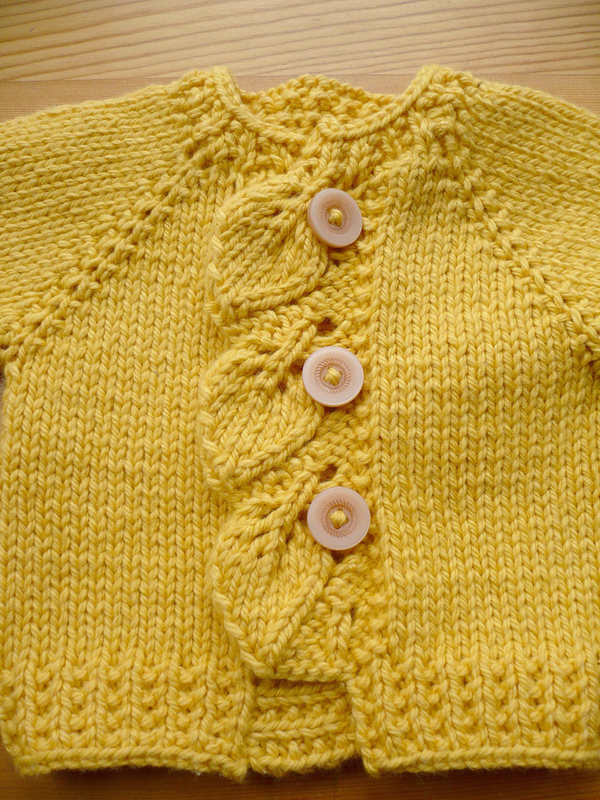 What a beautiful cardi! And you did such a lovely job knitting them both. I had no idea you were such an accomplished knitter! absolutely adore these! and i'm with everyone else - could you just imagine it in an adult size? I think I'd wear it to death! These are so cute! Makes me want to have kiddos! I love these cardigans. I've been knitting baby blankets for all my pregnant friends for the past few years, but the babies just keep coming and I can't keep up. 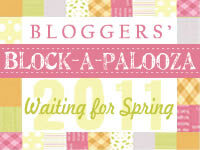 Maybe I'll switch over to cardigans or something I can make with less time! Is there a pattern? It is beautiful.